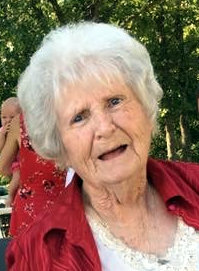 Funeral services for Norma Wilbanks, 86, West Plains, Missouri, will be held at 10:00 a.m., Saturday, February 2, 2019 at the Langston Street Chapel of Robertson-Drago Funeral Home. Mrs. Wilbanks passed away at 2:34 a.m., Monday, January 28, 2019 at Brooke Haven Health Care. She was born September 22, 1932, at Couch, Missouri, to Lynier Andrew Edwards and Vivian Marie Underwood Edwards. On August 2, 1949, she was married at Salem, Arkansas, to Darrel Wilbanks. Before her retirement, Norma had worked as a clerk in the shoe department at Richards Brothers and had worked at Wonderland daycare. She enjoyed square dancing and loved gardening and canning the produce she raised in her garden. Mrs. Wilbanks was a long time member of Berean Baptist Church where she had served as a Sunday school teacher, nursery attendant and took care of the Church’s kitchen. Her parents, one great-great-grandson, one great-great-granddaughter and one brother, Houston Edwards preceded her in death. Visitation will be held from 6:00 until 8:00 p.m., Friday, in the Langston Street Chapel of Robertson-Drago Funeral Home. Burial will be in the Howell Memorial Park Cemetery. Memorial contributions may be made to Berean Baptist Church and may be left at Robertson-Drago Funeral Home. Uncle Darrel, sorry for your loss….Aunt Norma will be missed by all. I have a lot of good memories growing up and spending the summers with Aunt Norma and you. Someday we all will walk in heaven together. Love ya, Jim and Nancy. Norma was an outstanding lady. She always spoke to me when she saw me. She was kind. She contributed to so many lives by just being herself. My heart goes out to you all. May your memories bring you comfort. Can you imagine that reunion in Heaven! Norma was a great person, who loved her family very much! I enjoyed working with her for years at Richards Bros. Sorry for your loss! Love you very much you watched me grow up. You was my mom’s best friend.And Darrel was my dad’s . You two were always my aunt and uncle. You were loved and will be missed. Our love always.